Today’s post is about an inspirational quote that is often misattributed to Benjamin Disraeli. Read on to learn who really wrote it as well as who is spreading this false information. 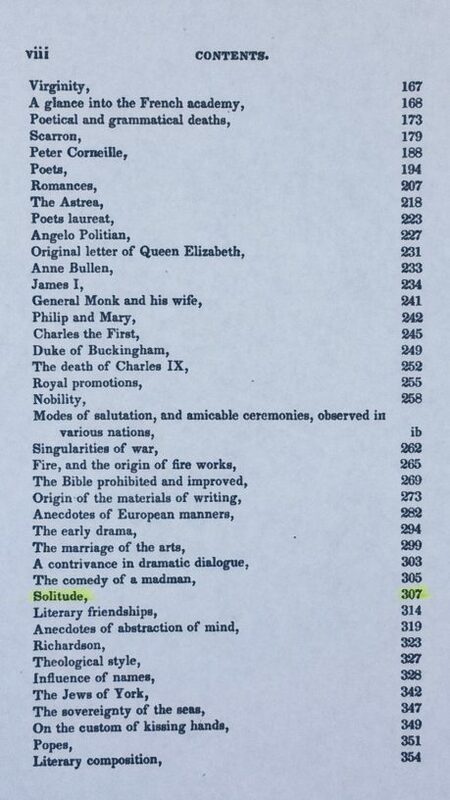 Here is the quote found in Curiosities of Literature originally published in installments from 1791 to 1823. Here is the title page showing Isaac D’Israeli is the author. Please note the difference in surname spelling in the above attributions. Even though they are father and son, they spelled their last name differently. Isaac spelled it with an apostrophe followed by a capital letter, as in D’Israeli. 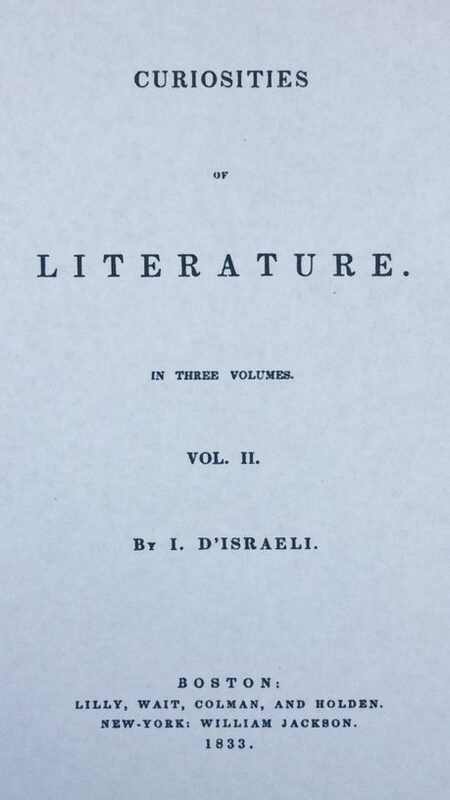 His son and future British Prime Minister, Benjamin, at the age of eighteen changed the spelling by deleting the apostrophe and changing the second letter to lower case; in other words, D’Israeli became Disraeli. 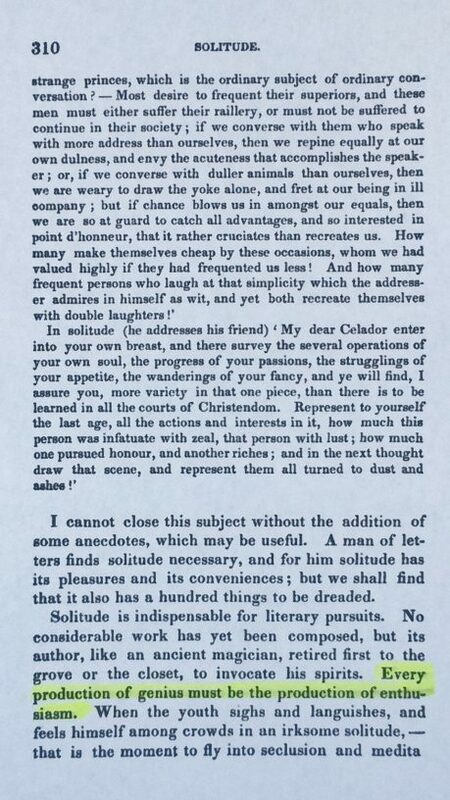 After Isaac’s death, Benjamin edited Curiosities of Literature by adding his own commentary and changing the spelling of Isaac’s surname to match his. This is why you may encounter two versions of Isaac’s last name depending on when the book was published. The above statistics indicate that websites with the sole purpose of providing quotes are the largest group propagating today’s misquote. If we combine them (42%) with the websites that provide quotes as a major part of their functionality (8%), we find that 50 percent of the websites perpetuating this misinformation are major quote repositories. As I’ve written before, quote databases of any kind found on the internet are notoriously riddled with inaccurate information. The administrators of these databases generally do not fact-check the data they are providing. Additionally, they often blindly copy quotes verbatim from other quote websites (probably also not fact-checked). I have actually seen on many occasions the same quotes with the same typos in the same order on different quote websites. Because of this general lack of integrity, these sites should be avoided like the plague that they are. The above statistics also show that social media websites are another major contributor to the proliferation of today’s misquote. They are the breeding grounds for the quote virus. The quote websites are typically where the initial infection occurs, and the social media websites are where the infection spreads like a virus across the internet. One person posts an infected quote, and all of his/her followers get it, and all of their followers get it and so on and so forth. This means whenever you receive a cute little quote meme on social media, don’t believe it. It is probably infected. During my research, I came across the quote book A Dictionary of Thoughts (Cassell Publishing Company, 1891) by Tryon Edwards which attributes all quotes by last name only. Today’s misquote is in the book attributed to Disraeli, spelled the way Benjamin spells it. Both men are listed in the index of authors with the same surname spelling. The problem is they are not differentiated with a first name initial for each quote; therefore, one can only guess which Disraeli said what. (Apparently, this was an oversight because other authors in the book with the same last name are differentiated.) There are other quote books during this time period that also cite by last name only, so we cannot definitively say that A Dictionary of Thoughts was the one that gave birth to this misquote. However, its lack of distinction between these two authors certainly may have contributed to it. The surname-only style popular during this time period definitely did not help things. I came across another quote book titled Dictionary of Quotations (Frederick Warne and Co., 1893) by Rev. James Wood which also attributes by last name only. Even though Isaac and Benjamin are presented with the same surname spelling (the way Benjamin spells it), the book differentiates by including the first initial for Isaac. Since the book attributes today’s quote to Disraeli with no initial, it is a misattribution to Benjamin. So this book is another possible point of origin for this misquote. In 1876 Queen Victoria ennobled Benjamin Disraeli Earl of Beaconsfield. Because of this, some quote books of the day refer to Disraeli as Beaconsfield. The quote book Many Thoughts of Many Minds (The Christian Herald, 1896) by Louis Klopsch is an example of this. Today’s misquote can be found in this book attributed to Beaconsfield instead of Disraeli, which means this book could also be another possible point of origin for our misquote. There are many services available that allow users to subscribe to automatic delivery of a new quote every day to their social media account or smart phone. Unfortunately, most of these services use quote databases derived from the internet which means they are simply additional conduits for misquote propagation. As with quote websites, these services should be avoided. Much like quote websites, modern quote books are just as unreliable. During my research, I came across eight books featuring today’s misquote. Five of them are quote books, and all were published in the 2000s. If a quote book is published after the advent of the internet, it will most likely contain quotes collected from the internet which means much of the data will not be trustworthy. This does not mean that quote books published prior to the internet are flawless (as today’s misquote shows); it just means they typically contain fewer errors. Most quote websites and contemporary quote books cite author name only with each quote. This is a sign the quote was probably not verified. The quote should include detailed source information such as book title, chapter number, play title, act number, scene number, line number, poem title, stanza number and/or line number. You should be able to easily find the quote on your own using the given source information. The source information should be from the originator. Citing a quote website or a quote book as a source is not legitimate. Citing a book in which the author claims someone said something without including a source is also not legitimate. The source should be the original work in which the quote is found. The name alone is not sufficient source information. During my research, I came across a quote website that lists Benjamin Disraeli’s date of birth as January 1, 1970. Apparently, this website administrator didn’t get the memo that Disraeli was born in 1804. Predictably, today’s misquote is also listed on this website. So not only is the attribution wrong, but the biographical information is wrong. Hence I repeat, avoid quote websites at all costs. Sadly, the quote virus has infected our academic community. I came across a high school teacher of AP European history who included today’s misquote on her website. There’s no vaccine for the quote virus, so the only way to combat it is through education. You, dear reader, can help by sharing the knowledge. You can do this by forwarding this post to family and friends. Also, if you know someone who is writing a book (seems like everyone is nowadays), this would be very helpful information to them, as many contemporary authors like to include a quote at the beginning of each chapter. If you’re on Facebook, “like” my Facebook fan page. If you’re on Twitter, you can follow me @SueBrewton. ← No, Margaret Fuller did not write that. Great blog, incredibly interesting history and set of circumstances that contributed to this quote mutation. Although, it appears that Benjamin himself set the entire process in motion when he just had to drop the apostrophe from his name. Great job sleuthing thus one. I encountered another quote by Disraeli that seems to be fabricated. According to several sources, Disraeli allegedly responded to an attack by O’connell (some say it was in the House of Commons, some say in a letter in the Times) by saying something like: “Yes, I am a Jew. And when the ancestors of the Right Honourable Gentleman were brutal savages in an unknown island, mine were priests in the Temple of Solomon.” It was allegedly uttered sometime between 1835-1837. I tried to find this quote (merely for personal interest I may add) in what seems like everywhere yet there is no reliable source for it. Do you have any idea where it came from? Or is it completely fabricated? Based on my research, I would say this quote is more legend than fact. The copyright page of this book states it is “inspired by the international workshop ‘Is there a Judeo-Christian tradition?’ as part of the UCSIA/IJS Chair for Jewish-Christian relations, organized by the Institute of Jewish Studies of the University of Antwerp and the University Centre Saint Ignatius Antwerp (UCSIA).” Clearly this is an academic source dedicated to Jewish-Christian studies, so I would consider it reliable. Additionally, The Yale Book of Quotations (a pretty reliable source) doesn’t cite a definitive source. Instead, three possible sources are listed. Also, another version of the quote with very different wording is listed, AND a second person, U.S. Senator Judah P. Benjamin, is attributed. Clearly, there is a lot of nebulous information surrounding this quote which makes it suspect. The Oxford Dictionary of Quotations, seventh edition (2009) is another pretty reliable source, and it features 88 quotes from Benjamin Disraeli and does not include this one. Unfortunately, this edition is not available online; however, the fifth edition (1999) is, and it also does not include this quote. Based on these three reliable sources and the fact that this is a hearsay quote, I personally would not consider it authentic. That’s my $.02 at least. If you happen to find something that seems authentic, please let me know. This research turned out to be an incredibly interesting journey, and I would love to know anything else of interest you may come across. Thanks for the great question, and happy quoting! Thank you for this elaborate and insightful reply. My own research agrees with you conclusion. I searched The Times Archive (where a famous conflict between Disraeli and O’Connell was published in the 1830s) and found nothing to support the validity of the quote. I also found several academic publications that categorize the quote as “apocryphal” and “likely untrue”. What puzzled me is that in the Internet this quote is cited quite extensively, and all attribute it to Disraeli and to his conflict with O’Connell. Moreover, Rabbi Sachs, the former chief rabbi of Britain and a scholar, uses this quote in one of his books (http://www.rabbisacks.org/search-jewish-identity-kedoshim-5776/) and attributes it to Disraeli. Thank you again for your answer. If I find anything new I’ll definitely let you know. Yes, the internet plays a major role in the spread of misquotes. All of my blog posts are about inaccurate quotes that are cited extensively on the internet. These misquotes become so widespread that they become a new “fact” that even the academics believe. It’s an uphill battle spreading the word about this, so I really appreciate your feedback!